VietNamNet Bridge – The Center for Preservation of Hue Relics has opened Khai Tuong Lau (An Dinh palace), where Vietnam’s last king Bao Dai and his family lived from 1945 to 1955, for tourists. The palace was built in 1917-1918 by King Khai Dinh, before he enthroned, by his own money. Khai Dinh’s son, Bao Dai, lived here from 1922. Since 1939, it became the assets of Bao Dai’s eldest son, Bao Long. Before 1945, An Dinh Palace was managed by the Nguyen Dynasty. After August 1945, it became the home of King Bao Dai’s mother and Bao Dai’s family. In 1954, after Bao Dai was dismissed, Ngo Dinh Diem administration confiscated the palace. Bao Dai’s mother bought the house at No.79 Phan Dinh Phung to stay until she died. After 1975, the revolutionary authorities took over and gave the palace back to Bao Dai’s mother but she donated the palace to the government. 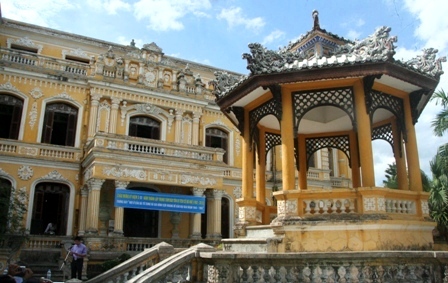 Since then until 2002, An Dinh Palace was managed by the Hue Labor Cultural House. In early 2002, it was handed over to the Center for Preservation of Hue Relics. The palace was restored in 2007-2008. The Center for Preservation of Hue Relics combined with German experts to restore 2,000sq.m of mural in the palace. 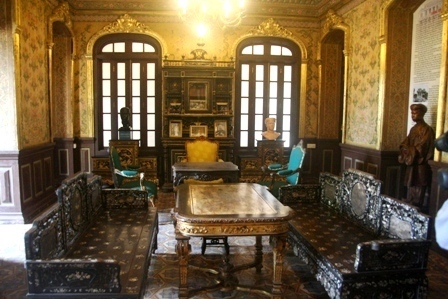 The current An Dinh Palace is decorated and displayed based on historical documents and witnesses.